[PATRICK GILMORE]. 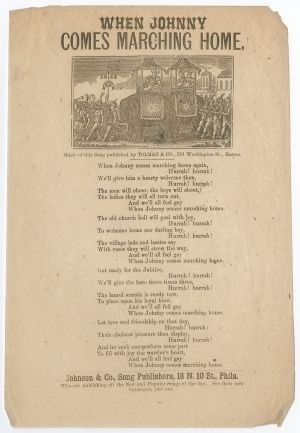 Broadside, “When Johnny comes marching home.” Philadelphia, Johnson & Co., Song Publishers. [1863-65]. 6 x 9 in., 1 p.
Noting that the music was published by Tolman & Co., Boston, and sung to the tune, ‘Johnny Fill Up the Bowl,’ the song’s lyrics were written by Irish American bandmaster Patrick Sarsfield Gilmore (1829-1892). Its first sheet music publication was deposited in the Library of Congress on September 26, 1863, with words and music credited to “Louis Lambert,” a pseudonym.